28 Apr How technology is changing the way we shop & how retailers are re-inventing to digital age? My current article is in continuation of my previous article which I had written on “Future of retail”. My current article is my attempt to share some key insights and business cases which has helped retailers reinvent themselves to a new phenomenon i.e. Retail 3.0. Retail 3.0 is the evolution of multi-channel retail distribution. It blends technology with physical brick & mortar retail. It makes customers (millennials) experience the brand and store more holistically by engaging them & reducing their pain points which a conventional shopping brings with it, for example carrying loads of shopping bags post-shopping to your vehicle and back home. It Provides convenience and increases the brand recall as the shopper has got himself or herself personally involved in shopping experience both an emotional and intellectual levels. Hence he/she can turn out to be brand’s influencers thus generating more feet-ins and brand recall through social media. How brands have adapted Retail 3.0? Company: Bonobos – for men’s clothing store wherein shopper goes n tries out clothes. If shopper likes it, they buy online and garment gets delivered to their home. Customer Benefit: No hassles of carrying shopping bags. Retailer’s benefit: Their Retail concept requires smaller area stores that carry limited inventory as it does not require stock room resulting in the addition of more trial rooms for the customers to try merchandise hence smaller spaces means lower rentals and lower inventory holding costs and thus bringing more operational efficiencies. Hointer 5: is the store wherein you can scan the type of denim jeans and brand of jeans that you want using an app & very pair of jeans that you want to try on will be delivered to a specific dressing room within the selected store of your choice. Upon trying you may buy it from an app or in case you decide not to purchase then you drop the garment to an allocated shelf and the garment is removed from the app automatically as well. 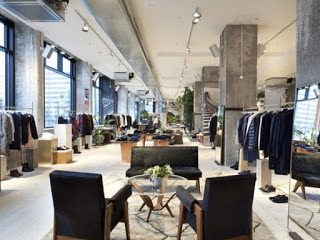 Brand based in Berlin is a unique example of Retail 3.0. The brand is basically fashion brand but the owners decided to do things differently and stand out from the clutter of fashion brands. They inserted a co-working space, restaurant, hair salon and music pods. They have created a space where their customers could spend the whole day lounging within the store. Result: Increased dwelling times, Increase in ATV, Increase in feet-ins, higher stock-turns of merchandise, regular visits from fashionistas resulting in free word of mouth advertising as fashion influencers were clicking pics of new merchandise and posting it on their social networks while enjoying free in-store wi-fi and sipping their favourite blend of coffee. I hope above real-life business cases would help my readers and retail professionals to re-energize their thoughts, their processes to re-invent their core purpose of business and would integrate their core business principles and values with technology and create a whole new retail ecosystem for themselves. Future belongs to those who dare to think different & act and believe in creating sustainable objectives for their brand. Any retailer or the brand owner willing to meet me for cutting-edge retail solutions, practical guidance for their retail projects can do so by emailing me at riteshmohan@yahoo.com.